When racing began in Indiana in 2018, King Lil Joe was ready to go. The three-year-old colt, who is by He’s All That, won the preliminary round of the Jarrod Duncan Memorial on opening night at Hoosier Park with Andy Shetler in the bike and returned a week later to win the final. He’s never backed down. Always alert, King Lil Joe listens to the races at the Shelby County Fairgrounds as Lori Maynard cools the colt out after his race. Owned by business owner Turrondus Smith of Canton, Miss., King Lil Joe has earned 10 wins in 20 starts this season for earnings in excess of $30,000. He also took a new lifetime mark at the Indiana State Fairgrounds in June in 1:54.3. 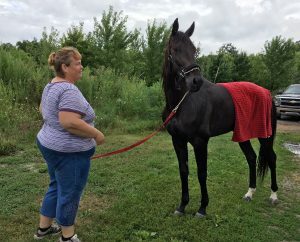 He hasn’t missed hardly any county fair races with Jay Cross as his primary driver and leads all sophomore pacing colts and geldings in the most current ISFC standings with 370 points through July 22. Miss U Big Mike is in second place with 167 through the same date over Woodside Banjo (152) and Wallyintheshade (129). Maynard has recently taken over training duties for King Lil Joe. Andy Anderson, who has been the primary trainer, recently returned home to Shelbyville. Maynard is now caring for the strapping colt. “Andy deserves all the credit with his success this year,” added Maynard. King Lil Joe is an impressive looking colt, owned by Turrondus Smith. He is always aware of his surroundings when he’s racing. It’s been a great match-up all summer between King Lil Joe and Miss U Big Mike. The two standout sophomore pacing colts have met three times with King Lil Joe defeating Miss U Big Mike twice and Miss U Big Mike winning once. 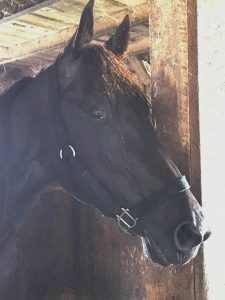 Miss U Big Mike was unstoppable in his recent mile at the Shelby County Fairgrounds in a gate to wire win in 1:58.0, a new career mark, over King Lil Joe. The two will face each other in the ISFC championships at the Indiana State Fair Thursday, Aug. 9 along with all the other divisional championships that night. In the other three-year-old divisions, Megaglide leads the colt and gelding trotters with 227 points over Canwetabemnow (205). Striking Encore leads the trotting fillies with 257 points over Queens On Fire with 231. Skyway Athena is the top point getter for the sophomore pacing fillies with 273 points over Seeyouinlalaland with 174 points.